Low PIM switches by Dow-Key are now available in SPDT, DPDT and SP6T configurations with SMA or N-type connectors. These switches are specifically designed to 3rd order IM requirements below -160 dBc; at 1870 MHz and at approximately +43 dBm with carrier frequencies 1930 MHz and 1990 MHz. As manufacturers have increased their push for higher data rates, larger wireless coverage, and system reliability, the demand for RF systems with passive intermodulation (PIM) has grown. PIM is a concern at the wireless system level because intermodulation products from an adjacent transmit bands appear in the receive bands raising the receiver noise floor. System performance is reduced and the wireless system as a whole becomes less reliable. 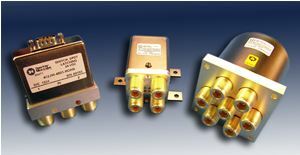 To contact Dow-Key for additional information on their Low PIM Coaxial Switches with N-Type Connectors, please click here.